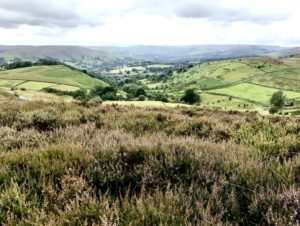 This walk starts from the pretty village of Hathersage, situated in the heart of the Hope Valley, and takes in the dramatic gritstone heights of Stanage Edge and Higger Tor. It is not for the fainthearted, but offers some of the finest views in the Dark Peak area of the Peak District. The stunning scenery and variety of terrain more than rewards the effort, plus there is a convenient stop en-route to allow the walker to sample arguably the best chip butties in Derbyshire. This is a circular walk of nearly 12 miles, with some challenging rocky terrain and steep descents. Walkers will need to be equipped with suitable hiking shoes or boots and should carry a map with them (OS Map OL1). There are a number of stiles along the way and some sections that may be slippery and muddy. There is free parking at the start and the walk goes past cafés for refreshments if required. Give yourself 7-8 hours to complete this walk at a moderate pace, allowing for rest stops to take in the views. The walk starts in the centre of Hathersage on Baulk Lane, a quiet lane to the side of the popular Alpkit adventure sports shop. There is usually street parking available in the village, or there is a car park located on Oddfellows Road, a short distance from the start point. Walk along Baulk Lane away from the village, ignoring a number of public footpath signs off to the side, and continue as the lane gives way to a grassy track through open fields. Remember to take a moment to look at the views all around you! 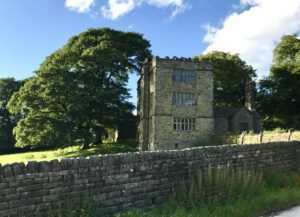 Up ahead on the hills to your right, you may spot the turreted North Lees Hall, widely believed to be the fictional Thornfield Hall in Charlotte Bronte’s classic, Jane Eyre. At a fork in the track as you approach Cow Close Farm, take the left fork down away from the farm towards a small gate in the fence, which leads to a narrow path with an orchard to your right and the grounds of Brookfield Manor to your left. At the end of this path, cross over Birley Lane and climb over the stile immediately in front of you. Walk straight on through the field and head towards a small gate in the stone wall, marked ‘The Warren’. 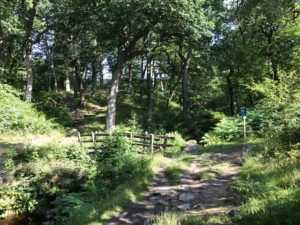 Follow the well-marked path through this beautiful oak woodland, with the stream to your left. After a few minutes, cross the wooden footbridge over the stream signposted towards Green’s House, and walk upwards through the wood towards a gate at the end of the path. Go through the gate and walk across the open field towards a second gate in the stone wall directly opposite. In the second field walk ahead, bearing slightly left, and cross a small footbridge over a boggy area. Head towards a stile in the stone wall close to Green’s House, seen directly ahead of you, and continue along the narrow path to the side of the house. At the end of this path, turn left and cross a stile to walk through the yard of Green’s House, following the signpost to Stanage via Dennis Knoll. As you cross the yard, keep a look out for a public footpath sign on your right, just before a small stone outbuilding. This path leads up and away from Green’s House, initially between two dry stone walls. Follow the path as it bears right, keeping the stone wall on your right and with open moorland to your left. As you follow this path over the moorland, you will see the imposing gritstone expanse of Stanage Edge ahead of you. At a National Trust sign for Outseats on the right, climb the stile over the stone wall and turn immediately left, continuing in the same direction but with the wall now on your left. Very shortly you will come to a road, at which you should turn left and cross the cattle grid ahead to reach Dennis Knoll car park on your right. At Dennis Knoll turn right and follow the well-marked path up on to Stanage Edge, with magnificent views along the Hope Valley to your right. After reaching the top of the path, turn right to walk along Stanage Edge. Very soon the main path bears left across the moorland, but follow instead the smaller path signed Access Land that tracks along the rocky edge of the escarpment. Follow this path along the whole of Stanage Edge, often across large gritstone boulders, and ignore any paths off to the left across the moorland. Please take care on this stretch – the ground is very uneven and can be slippery. The views can also be beautifully distracting; from here you can see across a huge expanse of the Hope Valley from Grindleford to Castleton. The path down from Stanage Edge is not well defined, so please keep a close eye out for it and follow your map. As you near the end of the gritstone edge, look out for the trig point on the rocks in front of you, marking the maximum elevation here of 457m. As soon as the trig point becomes visible, start looking out for a path that heads down to the right from the edge and over the heather moorland below. Follow this path through open moorland until you see a small track on the right that leads down towards the road. When you reach the road, cross over with care and turn left to walk a short distance on the road verge alongside the fence. There is a nicely positioned seat here on the other side of the road for a well-earned rest stop if needed. Look out for a gate in the fence that leads to a path across open moorland towards Higger Tor in the near distance. Walk across the moorland towards the road you can see ahead of you. 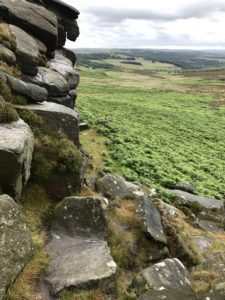 When you reach the road, cross over and take the path directly opposite up the steps on to the magnificent heights of Higger Tor, again littered with enormous gritstone boulders. As you reach the top of the slope up the steps, take the right hand fork in the path and head right (south) over the heather-strewn summit, walking towards the view of the Hope Valley. There is no defined path here, but you will find many tracks through the undergrowth towards the rocks at the edge of Higger Tor. Pick a route down from the rocks that best suits your abilities, but please take great care – there are some steep drops. Survey the land ahead of you and look out for the landmark of the sheep fold, a large, rectangular walled enclosure. You need to choose a path through the heather and bracken that takes you to the right of this and towards Whim Wood just visible in the distance. 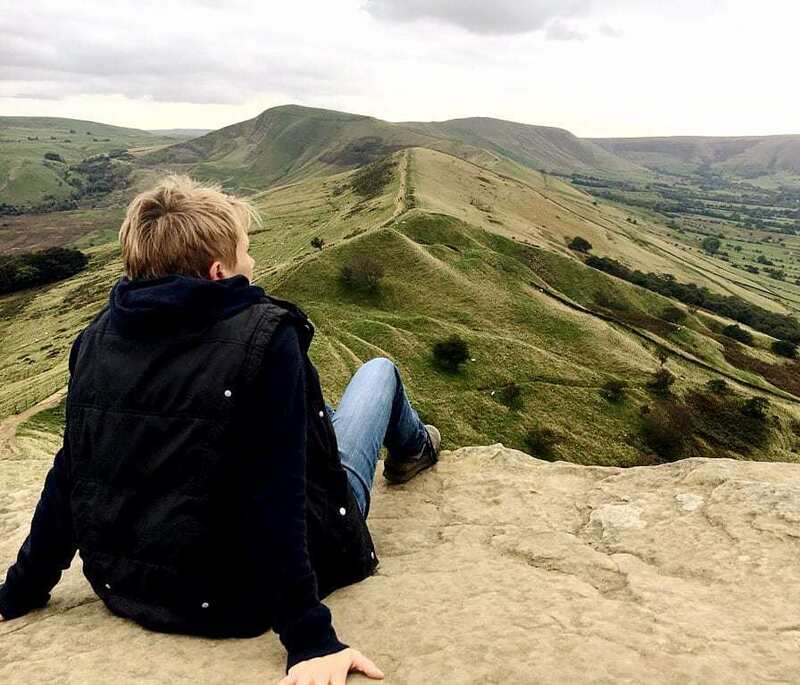 As you walk, make sure you look to your right to see the magnificent views of Hathersage, Hope, and Castleton to the west. 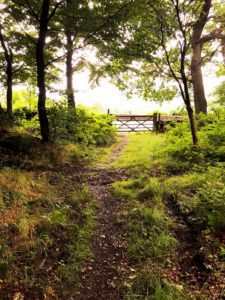 As you approach Whim Wood, look out for a wooden gate marked Access Land in the fence ahead. Follow the path through this gate, keeping a dry stone wall to your right as you walk. Look out for a gate in the stone wall on your right to take you into this pretty, mixed woodland. Follow the path through the wood, again keeping the stone wall to your right. As the woodland clears, look out for any of the many paths that take you to the left, and head towards a five-barred gate against the A6187. Go through the gate to leave the woodland and carefully cross the road, turning right to head down the hill. Walk on the pavement for a few hundred yards until you see a public footpath sign on your left that takes you towards the National Trust’s Greenwood Farm. 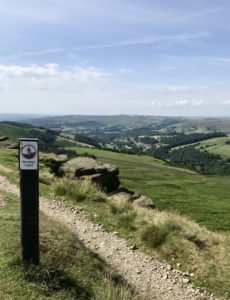 This is a well-made track, with beautiful views ahead of you towards Froggatt and Curbar Edges. Continue along the track, ignoring the paths off to the left and right, and follow the sign to Grindleford Station Café, walking past Greenwood Farm on your right. The track continues past houses, and soon reaches the Grade I listed Padley Chapel on the left. This is well worth exploring for a little while. Just behind the chapel building are the ruins of a medieval great house, Padley Hall, now protected by English Heritage. 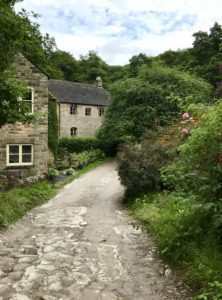 Continuing on the track, passing the Peak District Ranger Service Centre, Brunts Barn, on your right, you will soon walk down to the very pretty Padley Mill and cross Burbage Brook. Continue walking up the slight hill, past Grindleford railway station, and you will reach Grindleford Station Café on your left. If you’re in need of a rest and large portions of unpretentious food, this is definitely a good place to spend some time. Their chip butties and pints of tea are legendary, and they even bottle and sell their very own spring water. If you’d rather have something more refined, however, continue walking up the road and turn right at the top on to the B6521. You will see The Maynard hotel ahead of you to the left, which offers an extensive a la carte menu in its award-winning 2 AA rosette restaurant. Continuing the walk, passing The Maynard on your left, carry on down the hill walking along the B6521 for a short distance. There are more options for refreshments at the Grindleford Community Shop, situated within St Helen’s Church, which you will see on your left after a short distance. Cross the road carefully opposite the church and look out for a gate on your right with a public footpath marked Leadmill & Hathersage. Follow this path for approximately 2 miles and continue through a succession of open fields along the banks of the River Derwent, keeping the river always on your left. Watch out for herons, dippers and wagtails along this stretch of water. Follow the path onwards through Coppice Wood, which is part of the National Trust’s Longshaw Estate. Continue along this path, through a number of gates and open fields, past Harper Lees farm on your right, always with the river on your left, until you reach the B6001. Cross the road here and turn right, walking up the hill and returning to your starting point in the village of Hathersage. Continue on this path and turn right opposite The George pub at the end of the road, returning to Alpkit on your left.